The wolverine is a land mammal that weighs about 20 to 40 lbs and is about 25 to 35 inches in length with a 6 to 11 inch long tail. Males are usually larger than the females (almost double in size). A wolverine has a robust body covered with brown-blackish bushy fur, which is long, thick and glossy making it water resistant. There are yellow to gold bands running along each side from the shoulders to the rump. 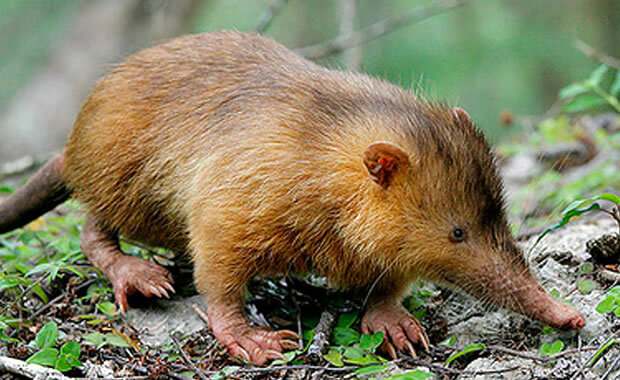 It has short powerful limbs with broad paws covered with fur and has white spots on the throat. It has a large head with small ears that are rounded, small eyes, and large powerful jaws with large strong teeth which help it to break down frozen carrion and bones. 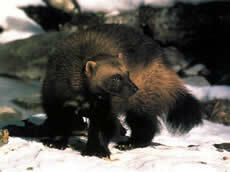 A wolverine walks with its head and tail held below the curved back giving it a hump-like look. Wolverines have a reputation of having a voracious (greedy/uncontrollable) appetite. They feed mainly on flesh and rarely on vegetation. They have a keen sense of smell and relatively poor eyesight. Wolverines are usually scavengers hunting only when necessary. They feed on carcasses of animals left by other predators, especially wolves. Their diet comprises of carcasses of whales and seals. They also consume deer, mountain goats, moose, lemmings, squirrels rodents, birds’ eggs and berries. They prefer cold habitats with ice and snow to make dens and store food in times of plenty. Wolverines are found in the Arctic and Subarctic in boreal, grassland, taiga and alpine forests and tundra of Asia, Europe and North America. They are solitary animals, and males are polygamous having a number of females throughout their entire lives. Males and females come together in the months of May thru August to mate. The gestation period is up to 2 months after which females give birth to a litter of 2 or 3 kits weighing an average of about 84 grams (0.19 lbs) and nurse them for about 10 weeks. The kits are fully mature by the 7th month but start living alone between 1 to 2 years. Wolverines have a life span of up to 15 years. The wolverine faces threats like being trapped and hunted, poisoning by farmers attempting to protect their livestock, and reduction of prey populations. It is listed as "near threatened" with the IUCH mainly because of their wide range of distribution. Attempts to list them as near endangered or vulnerable have failed due to governments being unable to balance between their protection and hostility from humans. Wolverine populations historically versus now are not known due to their scattered distribution in their habitat. Copyright Notice: This article is licensed under the GNU Free Documentation License. It uses material from the Wikipedia article "Wolverine". Glenn, C. R. 2006. "Earth's Endangered Creatures - Wolverine Facts" (Online). Accessed 4/25/2019 at http://earthsendangered.com/profile.asp?sp=10294&ID=3.